The lifetime of a wood fence can vary greatly; if made from untreated lumber, it will stand for seven to 12 years, while pressure-treated lumber lasts upwards of 30 years. If you want to avoid having to repair your wood fence for as long as possible, make sure that your fence is properly installed by professionals. That said, despite your best efforts, your fence may still need fixing one day, possibly due to reasons beyond your control, such as severe weather, vandalism, or an insect infestation. 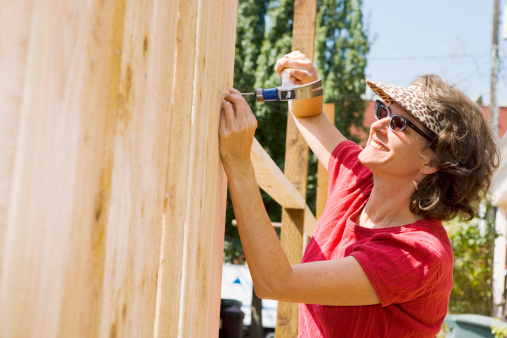 Repairing a wood fence is often a low-cost project that can be handled by a professional contractor, or if you have experience, you can handle it yourself with materials from a hardware store. An issue that commonly affects fences in areas with heavy rain, repairing wet and dry rot will require the affected area to be carefully cut out and replaced. To prevent this from happening in the first place, it is recommended that you make sure that the material for your wood fence is protected against excessive moisture. If termite damage does occur, the affected section will need to be repaired or replaced. Nails sticking out can create a significant risk, especially if the nails become rusty; that is why it is recommended that you remove and replace any popped nails as soon as you spot them. Sagging wood fence posts can be the result of several causes, including problems with the post itself or an issue with the hole it was placed in. You may be able to splint a rotted fence post, but if it has seriously deteriorated, replacing it is the only option. If the issue is with the hole, simply filling it in to lend more support to the post may be all that is required. Commonly occurring after storms, this will require wood fence repair that doesn’t cost much, as you can simply put the panels or rails back into place yourself. However, if the fallen parts were severely damaged, they will have to be replaced. A drooping fence can be caused by factors that vary from poor-quality wood to dampness or weather. A professional contractor can brace the fence with a tension rod to repair and prevent sagging. To ensure that you won’t require your wood fence to be repaired or replaced, make sure that it is properly installed and maintained. This includes directing any sprinkler away from the fence and clearing leaves in the fall. Also be sure to inspect your fence annually and clean it with a pressure washer, making sure it dries properly. In the case that your wood fence needs to be fixed, call Total Fence Inc. We provide wood fence repair at a low cost. We will take the time to install your wood fence properly, regardless of the type of lumber you use, so it will last a lifetime with proper maintenance.